This latest edition is a continuation of “19 Germany”. The intervening journal, “20 Dark Cloud,” is a self contained account of the hassles and heartaches we had with our fried laptop and a string of health issues. “Dark Cloud” can be skipped entirely without a loss of continuity if you choose not to read it. We said goodbye to our East German friends that had so generously shared their home and their lives with us for 5 nights and hopped on a train that took us most of the way across Germany to Frankfurt. We had planned on riding our bikes, but Bill wanted to confer with a big-city doctor about a new health concern, so we zipped to Frankfurt in a day rather than pedaling for weeks. Fortunately, all was well at the doctor’s appointment (more about that in “20 Dark Cloud”). While in Frankfurt, we spotted a slice of a TV news report on an Aztec exhibit that piqued our interest. Our hunch was right and the exhibit was just opening in Bonn, Germany, so we made the 2 hour train trip to see it. There were 400 pieces of stone and clay art from the 1500’s, all dramatically displayed (though no photos were allowed). As we carefully read every word in English, we were surprised to learn that the Aztecs revered both women who died in childbirth and people with physical deformities. The women who died in childbirth were given equal status to male warriors who died on the battlefield and both women and the disabled were assured a fast-track passage through the layers of the underworld in the afterlife. People with deformities were given near god status while alive but when it was perceived that the gods were mad, such as during a solar eclipse, they were the first offered in a string of human sacrifices because they were so special. Our only disappointment taking the detour to the traveling Aztec exhibit was the lack of comparison of the Aztecs with other civilizations. Living from 1300 to 1500 ce and lacking the wheel, metallurgy and having only 2 domesticated animals (dogs and turkeys) put them way behind many European civilizations that were well on their way with those advancements at least 2500 years earlier. But, at the time of their demise in the hands of the Spanish explorer Cortez, the Aztec’s city of Tenochtitlan with a quarter of a million people was the largest settlement in the world. We would have loved to see other aspects of their civilization put in context with those of Europe and the Far East. Along with the ease that comes from having been through Frankfurt several times, there was the jolt, as it is “Where we were when IT happened”. We unexpectedly found ourselves bumping into our 9/11/01 experiences 25 months later both when we arrived in Frankfurt at the train station and as we headed out of town by bike. Like revisiting Decin and recalling our 2002 flood experiences, it was odd to revisit 9/11 memory pods tied to physical locations. Two years ago the Frankfurt train station was our first stop after Bill saw the Twin Towers video online, almost real time. The churning mass of people on the day we arrived this year was in stark contrast to the stillness of the swarm as they stared in disbelief at an enormous overhead video screen reporting the incredible story as it unfolded. We vividly remembered the next morning when we felt like we were walking on egg shells as we tentatively stepped out of our hotel into our radically changed world. This year, as we rode the same route along the river out of town, I remembered the spot where I cringed as a tank sped by on flatbed rail car and wondered if it was a part of the response and if we would see many more (we didn’t). Less than an hour later, we remembered the intimidation we felt from the teen boys hovering in the underpass we had to traverse, recognizing that our stunned nervous systems were easily over-stimulated and this threat only materialized in our minds. As we approached an Asian restaurant that afternoon, I remembered eating there on 9/12/01 while the young English-speaking Asian hostess shared her worries for the NYC city relatives that she had not yet heard from. Little memory-pods were waiting for us all along the river route, including the kindnesses extended to us by the German people the first few days after the disaster. It is always an odd adventure to retrace our steps, to see how vividly or not we remember confusing junctures in the route and if we evade or fall for the deception a second time. And to remember where we shopped or stayed or ate. On this unexpected post 9/11 review, like on our Decin flood retrospective, we noticed that we were more available to take in the pleasing physical sights than the first time through. It took revisiting Decin, without the worry of the rising flood waters, to notice the interesting roof-top sculptures and décor. And in our first overnight stop on redoing our post 9/11 route, we noticed that the town had a great little museum that we had missed or lacked the attention to enjoy 2 years ago. For both the Decin flood and the 9/12 river route, it was soothing to intermingle some new, pleasant experiences with the old, more traumatic memories. But revisiting this river route hadn’t been intended as a walk down the historical events of our memory lane but instead to walk (and ride) in the foot steps of the Romans. Bill was primed to guide us along the course of the Roman Limes (lee’ mus) that was the edge of the Roman territory in Central Europe. The Romans often used rivers as their boundary lines but when the rivers weren’t in the right places, they extended their line with a system of forts. In western Germany, the Romans built 3 storey watchtowers to guard their boundary line and placed as many as 4 towers along each mile of border. These towers were about 15’ by 15’ at the base with 2½’ thick stone walls. At first the towers had stone foundations with wooden walls for most of their height. Later, the entire height of the tower was stone. Six to eight soldiers would live in the small tower and use burning torches to signal an attack to the nearby garrison. The 340 mile long (550 km) Limes was built from 150-260 ce and had a total of 900 watchtowers supported by 60 garrison towns. 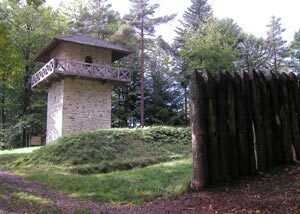 Reconstructed Roman Limes watch tower and palisades. And where the Romans go, they build roads. Behind the Limes was build a characteristic cobblestone Roman road with a several foot deep, heavily engineered substructure that sometimes lasted for 2000 years. And like me, those Romans were into the “Motel 6 by night” approach to Europe in that they took the comforts of their culture with them. Even these primarily wooden military garrisons had the typical stone baths with floor and wall heating systems, with some even having glass windows. Those things were unheard of in these regions of Europe, as were the lime mortar the Romans introduced to building construction, their tough molded terra sigillata pottery, and their efficient sewage systems. Most of what we saw of the Limes is reconstruction, as little of it survived and that that did was well underground. And most of the excavations are meager, with the watch towers only being rebuilt to about knee height. But the combination of actually walking and riding on the boundary line and seeing the bits and pieces in museums and in outdoor reconstructions nonetheless created a powerful experience for us. Some sights we see don’t require much imagination, like the stunning architecture in Prague or the mosaics in Ravenna, and others like the Roman Limes take a lot of filling in by our minds. We have repeatedly seen with our own eyes that the Romans loved straight lines, in their city plans, in their roads and apparently in their borders. Our map showing the Limes has a straight line running across it—so straight that it that looks like a map coordinate. The modern roads squiggle and curve, following the contours of the land, but not the Limes. Occasionally the Limes will take an angular, not curved, change in direction and then resume its ramrod straight course. They loved those straight lines for their roads too and we always chuckle when we are on an old Roman road in places like Rome because they are so remarkably straight and unlike the surrounding roads. The Roman commitment to ‘staying the course’ was made painfully clear as we huffed and puffed up terribly steep grades following their Limes. My replacement inclinometer is still in the bottom of Bill’s pannier but clawing our way along at 2.5 to 3 mph suggests that the grade was 15% or more. We climbed 500 vertical feet in the first 1.8 miles of our route one day, which would be an almost 7,000’ gain day on even a modest 25 mile course if it continued at that steepness. Fortunately it abated some, but we did an amazing amount of climbing for just going up and down in the low hills. And standing at the top of one of many low-elevation but steep summits, we gasped at the thought of the Roman’s iron-rimmed wagon wheels going down a stone-surfaced road on grades like these that kept our brakes smoking. Ah, and if that weren’t enough to impress us with the Roman resolve to straight lines, then the next day did it for sure. The grade must have been in the 20’s as even Bill bailed out on riding it. The damp, unpaved forest path sucked power out of our pedaling but it was an awesome grade even if it had been paved. Bill not only decided to walk part of it, which he rarely ever does, but he was quick to suggest we shove those bikes up the steepest part with 2 of us to 1 bike. We have never done that just because of the steepness—that strategy is usually reserved for things like stairs, boarding trains or single track trails riddled with rocks and exposed tree roots. And to think that the Romans built their defensive structures on that fierce grade rather that going around it…..
We had set out to ride the entire section of the Roman Limes but the constant steep grades without significant pay-off started grating on us. Bill compared the treats ahead in the form of museums and restored Roman structures with the pull of getting south to Spain as the cool, fall weather was settling in. It wasn’t long and we decided to again reverse our course and head southwest to Spain. We had seen enough of the Limes to satisfy our curiosity and Bill carefully noted the “must see” sights we missed for inclusion in a future trip through the area. Fortunately, some of the better sights overlap with things already on his list so we feel confident we will get back to the better parts of the missed Limes. Yes, we were in a hurry get to warmer weather but we stalled our exodus long enough to track-down an archeological site Bill read about in a book of visit-able sites we bought last year. This one is the burial mound of a 550 bce Celtic, or La Tene Culture, chieftain living in the Iron Age near the modern town of Hochdorf, Germany. An alert researcher located the burial mound by noticing that a farmer kept plowing up stones in an otherwise stone-free field. The reason soon became clear: there were thousands of tons of rocks used to create this burial mound. The full-size reconstruction of the mound, burial chamber and associated small museum of finds were worth the side trip. 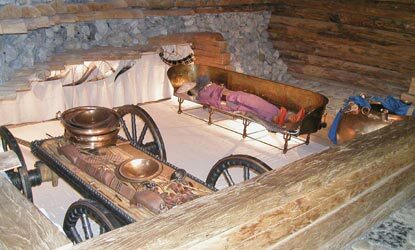 Celtic chieftain's reconstructed burial chamber with bronze couch & iron-clad wagon. 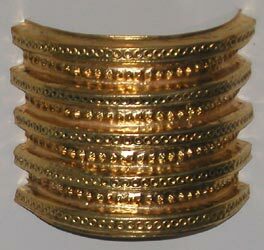 A reconstructed gold bracelet that adorned the honored Celt. Especially stunning was the reconstructed, 9' long bronze riveted couch with 8 decorated wheels used as the chieftain’s final resting place. A ceremonial wooden wagon was sheathed in decorated iron sheet and a 3' diameter Greek colony-crafted bronze crater (pot) with decorative lions was also included in the chamber. The chieftain’s body was covered with about 1 pound of gold ornaments, all which were manufactured at workshops constructed at the burial site. Unfortunately there was little English at the displays but Bill had been carrying the entire chapter from our book about this site since March and reading it greatly enriched our visit. Our trip towards Spain took a smaller detour to Baden-Baden (“bah-den”), which is a famous spa town in western Germany. The guide book’s description was beckoning and a day splashing in warm, healing waters sounded dandy in this chilly fall weather. Baden-Baden is a smart looking spa town with a casino that has its own history of attracting the rich and famous. Not being the gambling sort (except for riding bikes) we opted to take a tour to see the interior that was gushing with old world glamour. And we had separate gushing water experiences at the spas. Bill was drawn to the modern thermal waters that included a series of varying temperature, indoor and outdoor pools. I surrendered to the classical experience of the historic thermal waters which was a progression of rooms with steam, dry heat, and different temperature waters all in tall-ceiling rooms covered in tile. We were assured that both spas drew their water from the authentic thermal springs and we both had our stories to tell about our experiences. But alas, our Baden-Baden spa outing is better remembered by us as ending with the fateful evening that our laptop computer got fried. A seemingly insignificant trip on the power cord was enough to scramble its brains and cook the AC adapter. We didn’t know if it could be repaired or if our data would be lost, but we certainly didn’t imagine that we would have a harrowing month of uncertainty around it that was heightened by shipping confusion both going to the US and in coming back to us. (The full story is in “20 Dark Cloud.”) But the short story is that we eventually got it back and its brains were intact. After a brief lay-over in Baden-Baden, where we enjoyed our thermal hot springs experience but our laptop overheated, we were heading into France with our sights set on Spain. Our days were running short to get to Spain before flying home in mid-December and Map Man was scurrying to plan a new route that included rendezvousing in Avignon (“ahv-ing-known”) with friends visiting from Portland. Our life on the road is wildly unpredictable and our general plan often slips by weeks, so getting somewhere at a specific time is always a challenge. Now he had 2 target dates: meeting our friends in Avignon and catching a plane in Madrid. 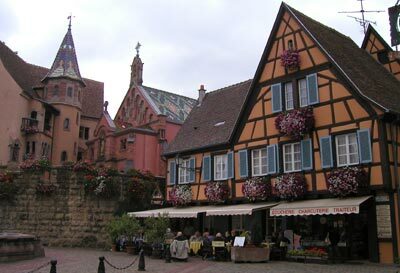 A typical Alsace old town square. Despite the distractions of the language challenges and a new set of road sign conventions to decode, Bill skillfully routed us to some of Alsace’s characteristically charming, 500 year old town centers. We scrutinized the details of the old buildings that had escaped the scarring from a number of recent wars; the usual array of old-town fires and the modernization process in general. The slightly twisted and tilting appearance of these timbered and stuccoed old towns gave them the look of having largely been preserved for hundreds of years, whereas the old towns of Germany and Austria seem more like villages rebuilt in the traditional style. And this slice of France was more provincial than the more industrialized region of Germany just across the border. We saw more villages with active barns opening onto main streets as we might see in the Austrian foothills. Then there were the remnants of in-town, mill-powering canals and street names reflecting bygone trades, like leather tanners that were potent reminders of the past lifestyles. We couldn’t believe the football-field-sized sink holes in parts of the Alsace country side, as Croatia was the only other place we had seen so many that were so large. (I remember a single sink hole in our hometown of Portland making the front page of the newspaper). As we pedaled by dozens of these grass-lined depressions, we wondered how the farmers had the courage to construct homes and huge barns on such uncertain land. Eventually, the pastures on the rolling hills gave way to the prestigious vineyards of the region where crisscrossing bike routes also began appearing. As in most places, it was hit-and-miss finding the bike routes as newcomers but the bits we found were a welcome stretch of more relaxed riding. Though it was also in this wine-tasting region that the sobering, life-sized, painted plywood cut-outs of a person started appearing, each with a number on it—the number of people killed by motorists last year at that particular spot. They certainly got our attention and we were amazed at how often they appeared in seemingly straight-forward traffic situations. One morning, when we were out of the vineyards and in ‘the flats’, we were greeted with a little fog hanging in the air. It didn’t warrant much attention until we turned off the main road onto a narrow lane in order to cross a river. It was so bizarre, as suddenly we felt like we were climbing up towards the stars as we pedaled up over an arching, one-lane bridge so enveloped in fog that we couldn’t see anything beneath us. Intellectually we knew our tires were still contacting the road surface, but all of our visual cues lacked the usual reassurance and did nothing to dispel the perception of floating. I half expected to discover that I had been lifted into the air by some carnival ride and really hadn’t traversed the bridge under my own steam. Once off the river’s bridge, both the fog and our surreal experience was just a memory. We drifted southwest through the Alsace region with its nurtured pockets of old world charm and entered the Rhone River valley with its more startling contrasts. The Rhone is home to the in-your-face big, modern cities of Lyon (“lee-own”) towards the north and Marseilles (“mar-say”) in the extreme south. Our trek south along the Rhone River was also the beginning of the French portion for our self-directed “Roman Structures & Technology 101” class. Sometimes we go in search of the Romans, as we did on the German Limes, and other times we stumble across them. But it is often no accident that we stumble across them ‘cause what was good for the Romans 2000 years ago is still good for us: they could be pretty cagy about getting over mountain passes and around rough terrain. The Roman trade routes (unlike their defensive walls) were usually built in sensible places that capitalized on river valleys, which is what we also like to do. And this Rhone River route was an easy way for us and the Romans to dodge the snowy Alps immediately to our east. Pont du Gard, the Roman aqueduct that served Nimes. All of France was an important Roman colony with their biggest cities being along the trade routes of the Mediterranean and the Rhone River. 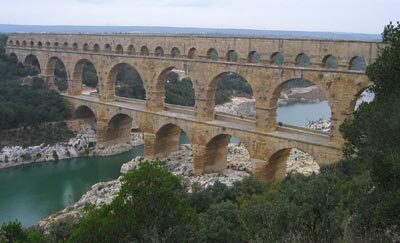 Like all Roman cities, the bigger ones in France sported massive stones being used to build massive aqueducts, arenas, circuses (huge tracks) and amphitheatres--all that would hold thousands or tens of thousands of people. Most of these monumental structures were cannibalized over the following centuries for the decorative marble slabs and great stones, in part because it was easy and in part because after the fall of the Roman Empire, people in the western world lost the knowledge of how to cut such stones for centuries. The biggest remnants left standing were spared because they were valued as fortresses or as a convenient structure within which to build small communities. Some of the arenas have been partially rebuilt in modern times and are used for contemporary performances. We lingered in Lyon for a second doctor’s visit and to visit the remains of their Roman heritage, especially their pair of side-by-side, hillside amphitheatres. 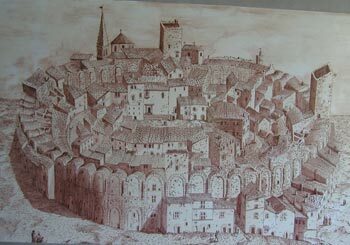 We also learned of Lyon’s important silk industry from the 1500’s which persists today. 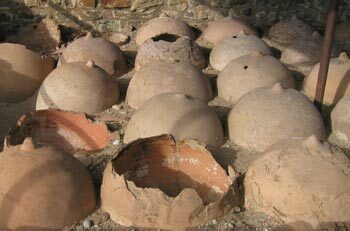 Not what you think: these are the Roman dehumidifying pots. Though we were clearly in an important industrial region, I had been a little surprised when Bill suggested we hop a train to go the short distance between Vienne and our next Roman heritage stop-over point, Orange (“ore-onj”). Bill was concerned that the quiet secondary roads and the sightseeing were both getting scarce and recommended just skipping over it. I wasn’t quite convinced until our secondary road into Vienne turned out to be fast traffic sandwiched between a busy freight railway line and the freeway—all of a sudden taking the train sounded lovely. Orange, Nimes (“nim”), Avignon, and Arles (“arel”) were cities on our south-bound route with noteworthy Roman sights. Of these 4, Arles, which we visited on 2 day rides out of Avignon, was the most memorable. Arles has several “way-cool” exhibits in their otherwise average museum. Someone in the model-making department must have been in charge of their own budget because they had a half-dozen very informative, table top sized, scale-models of Roman structures. One model was of a boat bridge, which in its finished form used boats as pilings for about half the length of the bridge. We had heard of sunken boats being used as construction material, but never of floating boats being used as a structural element by the Romans. 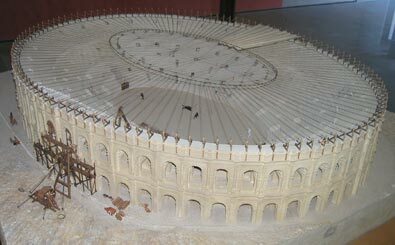 Another fine model was of an arena that both showed a cross-section under construction revealing the intricate system of arches underlying most Roman structures (even plazas), plus it depicted the removal cloth shade roof we have heard so much about. 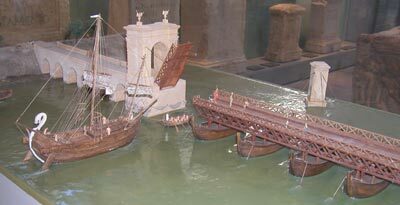 Arles museum's model of Roman boat bridge. And perhaps the most notable model, because it dispelled a myth, was of a hillside series of waterwheels used to grind grain. This was very exciting as we had read that the Romans had the benefit of the awesome power of waterwheels but were amazingly satisfied to employ slave labor instead of technology for this and other applications. 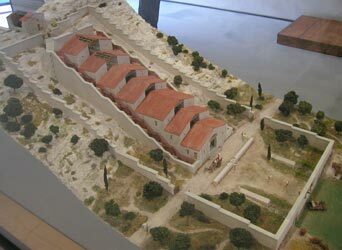 Apparently the Arles region was an exception to this general strategy, as the model depicted the excavated flour mill with 16 wheels on a 30˚ slope that produced 4.5 tons of flour per day—enough to feed 12,000 people. The Arles museum also treated us to the sight of some honkin’-big lead water pipes. In the past, we have gasped with delight at spotting a small-diametered section of Roman lead pipe, even if only inches long. 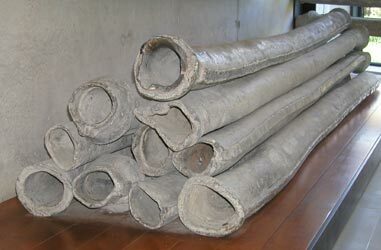 In Arles, they had a pile of 9' long lead pipes of about 4-6” diameter that had run under Rhone River to carry spring water to villas (“Those Romans…” they didn’t drink river water). And then there was the model of the circus, kind of a race track, constructed with 28,000 oak and pine pilings driven into the ground as a substructure for the stone viewing stands. This was the kind of museum visit that we savor—one that gives us juicy images to turn over and over in our minds, creating potent memories that get sharply remembered and built upon. Model of flour mill with 8 water wheels on each side. 9' long Roman lead pipes recently found on the Rhone River bottom. There are pockets around Avignon that, like Alsace, ooze with old world charm: the windy, narrow cobblestone streets and ancient stone houses with periwinkle blue painted shutters. And even in the late fall the skies still have a distinctive soft blue look to them that captivated Impressionist painters like Van Gogh and Gauguin. And the French seem to be masters at cultivating the “grand at one time” look that is a little dilapidated and haphazard compared with the prim and neat look of Germanic homesteads. The French countryside homes have a “work in progress” quality that is easy to imagine spans centuries. In Eastern Central Europe a similar look to the French rustic style wouldn’t have come from choice but from desperation and as a consequence, wouldn’t be so charming. The difference is like the visually fine line between eclectic and junky looking decorating—intention and choice make all the difference in determining the result. We were anxious to make up some of the 2 weeks we spent in Avignon dealing with our missing laptop and my shin growth, so took a train west to Rivesaltes in order to visit the even smaller village of Tautavel. That got Spain within striking distance and gave us the opportunity to see a prehistory museum at the site of an archeological find of a 100 bone fragments from about 20 different Homo erectus, all dating from about 450,000 bce. Archeologist’s estimate that some of our even more developmentally challenged ancestors were in the area about a million years ago. These folks kept their tool kit simple and primarily bashed away on food and other things with unremarkable looking rocks called “choppers”—naturally rounded rocks with one end intentionally broken off. We have seen these before and always chuckled at the imagination and seeming self-deception involved in being an archeologist. But our skepticism about the archeologists and these choppers was dispelled upon reading that microscopic examination reveals striation patterns that could only come from the choppers being used as a tool and couldn’t develop as rocks careened down a hillside or riverbed as we had imagined. To us, there is a certain “Mediterranean look” whether we are in Croatia, Greece, Italy, or in southern France (or northeastern Spain as we now are). Unlike the travel guides, our Mediterranean look has a backdrop of gray skies and gray water as we always visit the Mediterranean in the winter in search of relatively warmer weather (and we don’t want to be there when it’s hot). But those stormy gray skies have a similar look against the familiar gray-white limestone crags that are only partially covered with scrub growth and low pines regardless, of the host country. Gagging on backyard burning smoke is something we have also come to associate with both the Mediterranean countries and Eastern Central Europe. Though we are accustomed to seeing many rural plumes of smoke, only once before (in San Marino) have we seen people smoking-out an urban area with their burning, but saw several instances of it in southern France. Amazingly, in 1 town we biked through several times on training rides out of Avignon, there was somebody keeping a horrifically smoky fire going all day for at least 2 days. Heavy clouds of smoke continuously hung on the main streets. That person’s neighbors are certainly more tolerant than I would be. We also saw another smoky fire smoldering in another town core in the area. Too bad they can’t make these hot, quick fires that don’t lay down the choky layer of smoke for hours. The one’s we can actually see appear to just be debris fires and not some exotic kiln or other enterprise. The older Mediterranean men and women each have a characteristic look that also transcends borders. For the men, the familiar pattern is to see them clustered in male-only groups sitting on park benches or sipping a beverage in their sport coats and hats. They always look well-practiced at serenely hanging-out for hours on end. The women however aren’t hanging out but scampering between home and the market with their wicker baskets or 2-wheeled handcarts. I was startled to see that the old ladies in this part of the Mediterranean have that same compacted, squat look of the women in Greece that stunned me there. At 5’4” I tower over these Mediterranean women, some not much older in years than I am. And though I am about the same age as some, our bodies are clearly in different decades. I assume it is the years of hard physical work, poorer lifelong nutrition, and perhaps combined with the stresses of multiple pregnancies that compress these women by middle age. Lingering is definitely a Mediterranean art that is especially well crafted by the men of the region that we just don’t have the knack for. We are especially hampered by a lack of fondness for caffeine beverages, alcohol, cigarettes and cell phones (for the younger set) which are all helpful accessories for lingering in sidewalk cafes. For us, as poorly trained lingerers, the sidewalk charm of France is pleasant but it doesn’t beckon us like grand mountain panoramas or riveting museum exhibits. The regional nutrition in the past may not have been sufficient to set-up the people for robust golden years, but that has all changed now. The food in southern France is plentiful and varied and we looked forward to rediscovering favorite foods from our visit 2 years ago. In Germany it was the heavy, dark breads; the tasty and cheap muesli cereal; and Lebkuchen—those yummy, holiday-season, grocery store ginger cookies made without hydrogenated fats; that we searched out. In southern France, it’s the exceptionally tasty, prepackaged fresh salads that we remembered from before. These tangy vinaigrette salads come in sealed plastic tubs and we are especially fond of the grated carrots, the diced beets and the lentils with onions. Unfortunately, these savory salads are only available in France, and we have only found them in the southeastern part of the country. Ummm, but what a step-up for our curbside lunches of tuna and canned beans. And for some unknown reason, flavorful pink grapefruit juice is cheap and widely available in France—something we often go months without seeing and is a welcome change from our daily dose of orange juice. Our pleasant impressions of French historical sites, scenery, and food were unfortunately frequently marred by the interactions with the French people. I struggled for a few days to find the word that best described my experience of them and settled on “Obstructionists.” It seemed to hold as the right word, as it continued to be a concise description of the downside of the French people through out most of our visit. We were so taken aback, as we repeatedly found French people being rude and snippy without provocation for simple things, like asking about room availability at a hotel desk. And non-response seemed to be a fair game to play also: I was absolutely stunned when I uttered my brief French phrase to ask “Where is…” to the supermarket shelf-stocker and held up an empty bag of muesli cereal and she just stared at me without comment. I stared back and she finally gestured at the sugar-coated cereal isle where I’d already looked. Store personnel being that obnoxious in many places in the States would quickly be out a job. On one of our first days in France we couldn’t seem to find the correct little farm road to our destination town and had to keep asking passersby for directions. Even though it was an aggravating process, we considered ourselves as lucky as we seemed to be nabbing fellow tourists to ask—had more of them been French I fear we would have gotten less help than we did. And France is one of the places where we more often walk away from transactions feeling like we’ve been overcharged. I can go months without that thought bubbling up, but for spells in France that thought came to mind several times a week. For our first few days in France, the rudeness came in scattered bits but as we traveled south we seemed to hit unlucky streaks of it. There was the snippy hotel receptionist who flatly refused to let me see a room and was hostile about answering basic questions, like if there was a toilet, a sink, or a phone in the room. Less than an hour later it was the archeological site clerk that told us our bikes parked behind an open gate were creating a safety problem, which was obviously absurd as they were in the gap between a fully opened gate and a high stone wall. We won this battle by parking them across the street behind a bench in the museum’s other courtyard. I am sure she just didn’t like their looks there either but she could hardly play the safety card again. And as we told her, this was less than 2 days since the theft of some accessories from our bikes in a locked garage and we certainly weren’t going to take her advice and park them out on the sidewalk of a busy street. A day later, the short train hop between Vienne and Orange found us caught between conflicting opinions of the train staff as to where our bikes should be stashed, leading to a difficult and absurd shuffling of our bikes and gear through the train cars while underway, all for a 30 minute ride. And on a day when the French weren’t doing anything to improve their reputation, I sure didn’t need to have people cutting ahead of me in the grocery store check out line. And so as not to break their stride, the next day the our guide at the Nimes Roman arena said she would give the tour in both French and English if there were more than 2 English speakers. We were delighted when 2 more of our kind showed up but suddenly, 4 people fell short of her requirements. We fumed at the tour that was mostly sitting in one spot while she spoke only French and eventually entertained ourselves by watching the little dog joining us on the tour. Some critter’s scent had captured his nose and the quivering dog was rallying all of his discipline not go running off in hot pursuit. And as the tour group was filing towards the door, we discovered that the young Czech woman who spoke English but not French was also a bike tourist. We had a delightful time chatting with her and her 70-ish companion who was the grandmother of the children that the Czech woman cares for in London. We extended our visit with the unlikely pair of women during a light, sidewalk lunch. The sun was barely enough to warm us in the chilly fall weather but swapping travel stories with them helped take the sting out of the non-tour of the Nimes arena. Fortunately, by the time we made it farther south to Avignon, the out-of-the-blue obstructionist experiences with the French started dropping away. I suspect that Avignon is just too invaded and diluted by tourists of all nationalities for the difficult affect to persist (or be noticed) in all the commotion. There our experience of the French people was much more ‘middle of the road’ and seemed to reflect individual personality differences rather than a cultural or regional attitude. We did encounter some French people who were unexpectedly warm, sweet and intent on being helpful. But it was disconcerting to never know which face of the split personality we’d bump into next. For us, life is too short and France isn’t that neat to put up with so much hostility. Though we’ll be back to see some sights in western France next spring, it looks like France will continue to be a country in which we don’t linger but instead see the high points and then quickly move on. We slowly pedaled our way from Barcelona to near Valencia along the eastern Spanish coast enjoying mostly moderate and occasionally warm weather. Lingering in Valencia was cut-short by discovering that our hotel reservation on the long holiday weekend was only made for 1 night and not the 3 we had requested. Faced with little possibility of finding last minute accommodations, we took the train to Madrid 2 days early where lodging was available (because people in Madrid were heading for Valencia.). Our pedaling season was thereby cut-short a few more days but we’re enjoying sightseeing in Madrid before we fly home on Wednesday, December 10. We’ll fly back to Madrid on February 9 to resume another season of touring. And incase you heard about the severe flooding in southern France the first week in December, the answer is “No, we weren’t in that flood.” By chance, we left the region about 3 weeks before the Rhone flooded and that storm didn’t hit us in Spain either. But we were sorry to hear that Arles, home of the museum with the great Roman models, was under 3’ of water and the museum is situated right on the banks of the Rhone.